Our sound machine from Sharper Image finally died. This was a box that produced nature sounds to lull us to sleep. Over time its thunderstorms lost their punch, the crashing waves lost their rhythm and the fog horn went from deep bass to soprano. Well it was nice while it lasted, but now we can get the same thing for free from phone apps. “Lightning Bug,” is free for Android phones and tablets and gives you seven sounds to start with, though we’re not sure who would choose sirens or car horns to induce sleep. Tap the icons to go through the sounds or to take a couple and combine them. Rain and thunder came together well and we had out thunderstorm back. Sounds good! There are more sounds available in packs for 99 cents each, such as beach, jungle and forest. 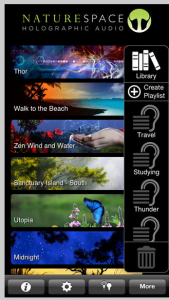 The Naturespace app gives you six free sounds. But we didn’t like the “infinite shore” routine because the waves came crashing in without a break. That’s not the way we remember waves. The “Rain into Water” sounded like a leaky faucet. “Daybreak songbirds” might appeal to some who don’t want to go to sleep. In all of this, your cellphone is burning its battery, of course, so it would make sense to have it plugged in and charging while it takes you on the ride to dreamland.